Ophthalmopathy, is a condition that causes the tissue and muscles behind and around the eyes to swell, producing a staring, bug-eyed look. In some cases, patients can have trouble closing their eyes completely. The eyes can become itchy, dry and irritated, but they can also become watery or teary. The patient becomes increasingly sensitive to light, and the swelling can cause pain, pressure or double vision. Ophthalmopathy is a symptom of Grave’s disease, which is an immune system disorder that causes hyperthyroidism (overactive thyroid). 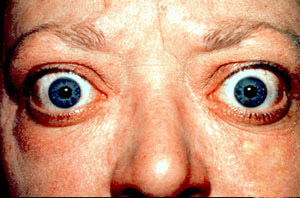 About 50% of patients with Grave’s disease will develop Ophthalmopathy. Inflammation that is caused by a faulty immune system leads to the swelling that causes Grave’s ophthalmopathy. The dryness can be treated with eye drops or artificial tears. Non-steroidal anti-inflammatory drugs such as Ibuprofen help reduce inflammation and pain. In severe cases, immunosupressants or corticosteroids may be prescribed. Though uncommon, surgical decompression can be used to reduce the swelling and pressure, particularly in severe cases of nerve damage or loss of vision. Radioactive iodine therapy is usually the first line treatment for Grave’s disease. 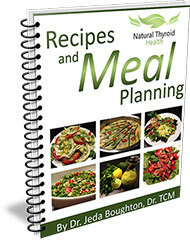 The iodine is absorbed by your thyroid gland and the radiation destroys the thyroid tissue to reduce or stop thyroid hormone production. Though, the radioactive iodine will reduce your hyperthyroid symptoms, it unfortunately, can make your eye condition worse. Natural health modalities such as traditional Chinese medicine offer herbal remedies that can help restore your immune system and reduce swelling. Since ophthalmopathy makes your eyes more vulnerable to both bright light and ultraviolet rays, wear sunglasses. Wrap-around sunglasses will also protect your eyes from the wind. Keep your head elevated when you’re in bed or lying down. This will reduce the amount of fluid accumulating behind your eyes. A cool compresses can also help relieve pressure and soothe your eyes. If you smoke, quit. In addition to all the other health problems smoking causes, it can aggravate ophthalmopathy. Other environmental toxins that can also make ophthalmopathy worse include artificial sweeteners, such as aspartame. Drink plenty of water, dehydration will make the dryness worse. The symptoms of Grave’s Disease can be treated successfully, seek professional advice if you notice any changes or swelling of your eyes.